Hearth Accessories — Smith & May Inc.
We have everything you need to take care of your stove, fireplace, grill, and more! Please note that we are unable to showcase all items on the web site due to space constraints, and the fact that our inventory is subject to change. So call us if you can't find what you're looking for. Special orders are welcome and require a 50% deposit. A cricket on the hearth is a symbol of good luck. Available in polished brass or verdigris finish - 5" x 1.5"
This product will remove creosote, smoke, soot and grease from glass fronts, stone, brick, the hearth or even barbecue grills. Clears smoke filled air when you have an accidental down draft due to wind. Stops annoying stove and fireplace odors during damp humid weather. Formulated to remove smoke residue, soot and creosote from masonry surfaces. Will not harm metal, glass or fiberglass. Non-abrasive White Off glass cleaning cream is specially formulated to remove white residue caused by gas log fires on glass fireplace doors. A safe strong non-scratching formula that removes baked on smoke, soot, creosote, carbon and mineral residues from glass. Keep your fireplace free of ash & under a tight lid. 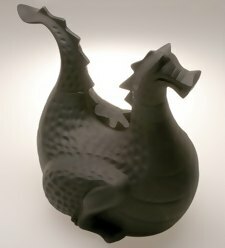 Wrought iron crane, matte black, perfect for warming a pot of stew. Matte black, many different embossed designs available. Help reflect your fire's heat into the room. Tuscan style grill for your fireplace. Protects and renews the beauty of cast iron or steel. Non-toxic, non-flammable.Not for use on painted surfaces. Conditioning glass cleaner for tough stains on glass doors of wood stoves. Non-abrasive cleaner for removing white mineral residue on gas stove doors. Black, pewter or antique copper finish. Short or long, black 0r orange. Vacuum ash & warm embers safely while filtering the dust. Have hearth side access to your wood pellets. 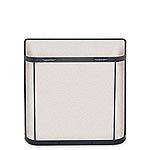 Holds 3 gallons of ashes, coal or wood pellets. Mount in a doorway and transfer heat to an adjoining room. Attaches magnetically to stove pipe. 100% all-natural, loaded with resins. Ignites instantly: two sticks start a roaring fire. No more newspapers or chemicals! Mmmmm, smell the wonderful scent of cinnamon when you toss a few scent cones into your fire. The adorable basket with wooden handles contains a 1-lb. fat wood bundle, 2 wax-bottom starter cones, and a small bag of aromatic baby-cone potpourri. Toss these cones into your fire and watch orange, red, blue, and green colors dance in the flames. Box contains 12 cones. Toss these sticks into your fire and watch orange, red, blue, and green colors dance in the flames. Use these extra long match to touch off your fire, or light lots of candles without burning your fingertips! This is a waterproof fire starter that works as intended, with no need for newspaper or kindling. Little Bucket Firestarters™ are compressed wood shavings with a small amount of wax. They are unscented, and each one burns for 20 minutes. Welded steel grate available in many sizes. Same bar grate construction with an ember retainer. Cast iron grate in basket design. 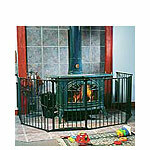 Cast iron grate with a lower profile for the smaller fireplace or stoves. One piece cast iron grate with a contoured shape. Most all screens are available in many stock sizes and finishes. 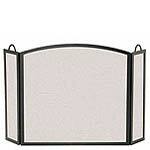 Screens can also be made to order in custom sizes and finishes. We have single panel, 3-fold, spark guard & child guards. Stop in to peruse our catalogs for special order screens. Don't forget to measure your fireplace opening or stove and the area of your hearth. 100% fiberglass - available in tan, charcoal, brown & green, 2 sizes. Braided wool - available in many colors. Olefin with jute backing - many styles & colors. 100% wool, made in Belgium - half round & rectangular, several colors. 100%wool, several designs & colors - half round & rectangular. 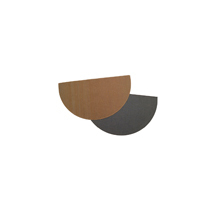 100% olefin in half-round or rectangular shapes and many colors. Available in 30" & 36" length, vintage iron or matte black finish. Available in vintage iron or matte black finish. 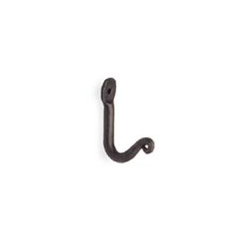 Available in 2, 3 or 4 hook sizes, vintage iron or matte black. Pilgrim Tools are made in the USA, top quality, various finishes and styles available either in stock or by special order. Designed to be used as fireplace tools with tongs included - available in various handle designs and finishes. Designed to be used for a wood stove (includes ash rake instead of tongs) or a raised FP hearth - also available in different handles & finishes. Elegant, yet simple, matte black w/burnished bronze handles. Designer tools in burnished black finish - matching log holder & screen available. Designer tools displayed in a soldiered row - vintage iron or burnished bronze finish. These tools are hand crafted in Maine, sold individually, in matte black finish. Matte black, welded construction - 3 sizes. Burnished black- fitted for smaller hearths. Available in bronze or graphite finish. Powder coated black in two sizes. Welded solid steel, matte black - 24", 36" & 48" sizes. Forged iron, non-marring wheels, wood handle. Heavy duty steel, black w/waterproof cover. 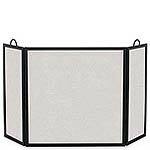 Heavy duty steel, easy assembly, 4' & 8' sizes, cover available for 8' rack. Heavy duty steel, you provide 2x4's at desired length. Sage green with closed ends to catch loose debris. Dark brown suede with open end to accommodate a variety of log sizes. Available in black, galvanized or copper. Premium quality carry-all features easy grip handles, rot-proof and stain-resistant fabric, and heavy-duty double stitching.